So far we put all the code in one file. In previous example if we wanted to add more balls we would have to add several lines of code for every ball we add – like creating new bitmap, setting new position, anchor etc. Even the functions are written in a way that they call “ball” methods directly. How to avoid this and make it more universal, more reusable? I will not go into details about Lua language but in short, Lua does not support classes the way that languages like C++, Java and ActionScript do. It has roots from prototype-based languages. In Lua, each object can define its own behavior through metatables so in a way we emulate OO programming and classes in Lua. It is through the inheritance that we can “emulate” the classes just like in other languages – they will have variables, methods etc. Then we put these classes into their own files and Gideros will load them automatically. We use the Core.class function to create our own classes through inheritance. We can inherit from Sprite, EventDispatcher and so on. Keyword self is the equivalent of the this pointer in C++ and it is a reference to the table which is created as part of the Class.new() command. As you can see, in the and it looks similar to OO in other languages. In above example we put all the code in main.lua but we could take all the (class,methods..) code (line 1-18) and put it in player.lua file and the rest we would leave in main.lua. This is what we will do in next example. Now lets take the code from previous tutorial and turn it into what we learned today. First you create a ball.lua file. The code is pretty much copy/paste from or previous ball example except that we access variables and methods with self (it is also used instead of word ball). As you will see we use word self. I understand that we access class variables and class methods with self word but I am not so sure why we need to pass another self to self:addEventListener function (if you know let me know in comments, I am still learning). This self word is use everywhere so it can be quite confusing for beginners. -- we don't need to check if the ball is moved? and that’s it. You can see it is much clearer this way and we only need to create new Ball objects and you will have new ball with all the methods and all. Try to add new balls and you will see them appearing on the screen and each ball can be picked up, dragged etc. You can create of course a lot of classes like this, for every object you want. If you had a football(soccer) game then we have the ball class already. Then you would for example create player.lua and put all logic for all players there – they all behave in similar way. You could create a goalie.lua and referee.lua class/file for goal keeper and referee if you want because they behave differently and have different logic than players (or you could use different methods in player.lua class, as you wish). If you had an active audience you can create audience.lua class etc. You don’t need to create these classes just for objects – you can also create it for example to handle all the audio effects in the game and so on. We are currently just passing a texture file name to Ball class init() method and then randomly setting x and y but you can of course change this and pass x and y . This way you can create new ball at any position you wan’t. You can of course pass other arguments ,as many as you wan’t. So far we only displayed some graphics on the screen, we even animated (not real animation though, just rotation of one bitmap) it but there was no user interaction at all. We had one event in Tutorial 4 but it was not really explained in details what it does. With events we handle responses and they allow us to create interactive applications. The target of an event is a listener function and an optional data value so when an event is dispatched, the registered function is called. If the optional data value is given, it is used as a first parameter while calling the listener function. In Gideros we have built-in events generated by the system (e.g. ENTER_FRAME event, touch events, timer events, etc.) and custom events which can be generated by the user. Just to make it less confusing: We don’t actually use mouse on smartphones of course so you can use MOUSE_ events to handle only a single touch on specific object. In case you want to handle multi touch then you should use TOUCHES_ events because they will provide you with more information about current touch id and all available touches on the screen. Here is a quick example of an event and function it calls. Let’s suppose we already loaded bitmap ball. So basically what this means is we attached addEventListener to our ball object and what it will do is it will call function rotateBall on every frame change. If we would have Event.MOUSE_DOWN instead then rotateBall function would be called every time we press/touch the ball. At the end of this tutorial we will have a rotating ball that will randomly change direction, rotation speed and play a sound every time you press it. In next tutorial (tutorial 6) we will add some events that will make the ball dragable and the effects of picking up and dropping the it. Ok, enough of theory, let’s build an app (with graphics and sound effects). Create project “Events” and add main.lua. Note: So far we put all the files in one folder but as the app grows larger it is better to be organized. So we will put graphics in gfx folder and sounds in snd folder. I prepared a file for you so download it and extract it to your project folder. 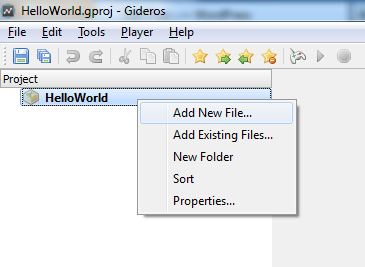 Important: Gideros project folder structure is independent of your OS folder structure so you will have to create folder in Gideros by yourself and add existing files there. In theory this means that you might have all the files in one folder on disk but in Gideros they are nicely structured – or the opposite of course! So we just wrapped the code with hitTestPoint function (lines 2 and 5). This hitTestPoint function simply checks if the given coordinates are in bounds of the sprite/object. Run it and now it only works if you “click” on the ball. I don’t want to make this tutorial too long and hard to comprehend so we will add some additional events in the next tutorial. It’s nice to have something else on the screen than just text. Let’s try to draw some shapes. I will leave out step-by-step explanation on how to add files to projects, how to start Gideros Player etc because this was covered in previous tutorials. You can draw primitive shapes with Gideros on the screen. Create new project, name it “Shapes”, add new main.lua file and open it in editor. Remember that in Gideros we create every new object (sprites,textfield,shape,bitmap…) with the keyword new. Add this code (comments — are in the code) to main.lua, run the player and you will see black line on your screen. I think it is not hard to see what is going on here. We can use pen & paper analogy to explain it even simpler: The “moveTo” function is like lifting a pen off the paper and moving it to a different location without drawing anything. The “lineTo” function draws a straight line from current pen location to the destination location. As you can see once we create new Shape object named myShape we always use “myShape:” to change it’s properties, do something with it etc. Now let’s draw a rectangle, fill it will color and apply some transformations learned in previous lessons. Shapes are “anchored” at the graph origin (0,0). The anchor point affects how the shape behaves when manipulated (e.g., rotated, scaled). If we want to prevent out rectangle from previous example to move off the screen we first create the shape at 0,0 coordinates (left top corner) and then move it to 100,100. Play with it a little, create different shapes. Every tutorial starts with “Hello World” and who am I to break this tradition? 🙂 Please keep in mind that I will not be teaching Lua language, concepts of Objects, functions etc. I am assuming that you are a developer who knows at least one language and have a basic understanding of how programing works. Again, I am just learning Lua too so you don’t need to be master Lua to follow this tutorial. We will create 2 versions of “Hello World” – one that prints to console and one that prints to your mobile device phone screen (or Gideros Player). name it main.lua and click ok. This is how you will add new code files to your project. Double click it so it opens in the editor. There is our hello world! Of course this is handy when we need to debut or test something but what we want is this text to appear on Player or our smartphone. Save it, run Player and you will see text “Hello World” displayed there or on your smartphone (you have to run the Gideros app on your smartphone first of course). Great, your first mobile app is finished! This is a comment so we can ignore it. In Lua you start one line comments with --. Please check some Lua tutorials on net for more. 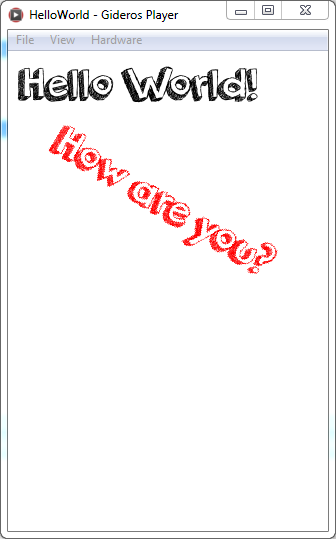 What we do here is create new text field object with the text Hello World!. Word nil just means that Gideros will use the default font. We assign this to local variable myTextField. Our myTextField is now TextField object so we can access and use/set all kinds of methods, events and properties. In this case we simply set the position of our textfield to appear on screen (X=40, Y=100). In all our previous lines we just created textfield, set its parameters but we have to display it on our screen. Think of stage as screen for now so everything that we want to display will have to be added to stage as its “child”. Now let’s have some fun with text. Download this font from 1001freefonts.com and extract it to your HelloWorld project folder. Right click on the HelloWorld project icon and select Add Existing Files.. and select the “orange juice 2.0” font. -- for oneMoreTextField we set all kinds of properties - position, color (in HEX), rotation.. This is what you should see if you did everything right. Cool!